Reliable & Affordable. The Professional alternative to Doing It Yourself. 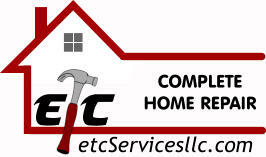 Etc Services, LLC is a full service home improvement handyman services company serving Genesee county and surrounding areas. We provide professional, safe, reliable handyman services for your complete “To Do” list. We understand that a growing “To Do” list can leave you feeling overwhelmed. Regardless if we’re handling a large remodeling project or a small “fix it” repair job, you can be assured that we will be providing you with high quality craftsmanship and the attention to detail your project deserves. At Etc Services, LLC, we have a single mission with every client and every project - complete customer satisfaction! We consistently focus on the needs of our clients, providing personalized attention to detail and a stress free experience. Call us today for a “No Obligation” discussion about what you have on your “To Do” list.